Ankle injuries after a slip and fall accident can range in severity and result in severe pain and limited mobility problems. When people injure their ankles in slip-and-fall accidents that result from the negligence of a business or an entity that is in control of the premises, the injured victims might recover damages by filing personal injury lawsuits against the business or property owner under a theory of law called premises liability. Here is what you need to know about ankle injuries that might occur in a fall accident. Your ankle joint is comprised of a combination of three bones, tendons and a joint capsule that is called the synovium. The ankle joint is formed where the three bones join together, including the tibia, the fibula and the talus. The lower part of the tibia makes up the inner anklebone while the fibula makes up the outer anklebone. The two join together to form an arch that is seated on top of the talus, which is a bone that is in your foot. The bony architecture of the ankle is covered by a membrane that is called the joint capsule. It is lined with a smooth tissue layer called the synovium which encases the bones and contains a fluid that helps to facilitate smooth movements of the bony surfaces so that you can walk. The joint structure is held together by several ligaments and tendons. An injury can happen to the bones, the tendons, and ligaments or the synovium, resulting in several different types of ankle injuries. Several different types of ankle injuries can happen in a slip-and-fall accident, including sprains or strains, fractures and tears to the tendons or ligaments. The treatment and recovery time will vary depending on the severity and type of the injury that you suffer. When you fall and injure your ankle, you may suffer a sprain or a strain. In this type of ankle injury, your bones are not damaged but the ligaments are injured or stretched. Sprains or strains can cause severe pain and limit your ability to use the compromised ankle. The functional limitation may last for months and require a substantial amount of recovery time. In some slip-and-fall accidents, people suffer from ankle fractures in which the bones are broken. These breaks may involve the talus or either one of the lower leg bones that form the joint with it. 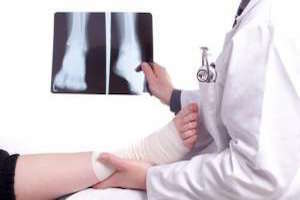 Ankle fractures may be very serious and require a substantial period of time to heal and recover. In some cases, a person who suffers an ankle fracture may have permanent limitations to the ankle’s functionality. In slip-and-fall accidents, there are several ways that your ankle can be injured. If you slip or trip over an object, causing your ankle to roll, the action can cause both fractures and tears to the tendons or strains to the ligaments. Some slips, trips or falls may cause your ankle to twist side-to-side or to hyperextend the joint. Either of these types of stressors placed on the joint can cause any of the major categories of ankle injuries. These injuries are common in slip-and-fall accidents because people naturally try to stop their falls by stepping down hard with their feet, which can cause the ankles to turn or twist unnaturally. They might also happen when you trip over an object, causing your foot to bend at an unnatural angle. Property owners and occupiers have a duty of care to keep their premises reasonably safe for people who are lawfully present on them. If they do not take steps to correct hazards that are present that they either know about or should have reasonably discovered, they may be liable to the injured victims for their losses. Property owners must warn people about existing hazards that cannot be immediately corrected by using signs or roping off areas that are hazardous. Under California law, a business or property owner’s failure to correct known hazards or those that the owners should have reasonably discovered is considered to be negligence. Injured victims whose injuries resulted from such negligence may recover damages by filing personal injury lawsuits under a theory of premises liability. If you have been injured in a slip-and-fall accident, contact an experienced personal injury lawyer in Los Angeles today for your consultation.